Squatting is deemed as one of the best exercises for lower body strength and overall muscle development. Younger athletes can especially benefit from squatting, this movement will help increase range of motion (when performed properly) and build leg strength with stability for the future. When squatting there should be an effort to achieve full-depth, this will ensure for optimal growth and strength gain. Hamstring and calve contact should be made to ensure full-depth is being achieved. The chest should remain tall without the lower back rounding. Toes angled slightly out, while driving the knees out to create a hole to sit into. Head is in a neutral posture, and arms are tight enough in on the bar to create a shelf with the traps for the bar to sit on (this picture is a high-bar Olympic styled squat). So why should hockey player squat? Let alone go to full-depth? Most bang for your buck: by achieving good form in a full-depth squat you're creating the most response possible in the muscles being worked. When you cut depth out you lose stimulus in muscles being targeted, for example, you'll miss out on musculature used to create increased hip drive from the bottom position. In short, the deeper the squat the higher the neuromuscular response will be; facilitating the most muscle fibers being stimulated. Joint stability: there's no debate that being able to maintain good posture with weight on your back will increase joint stability. The ankle, knee, hip, lower, mid, upper back, etc. will all benefit by handling weight through various ranges of motion. In hockey the back and lower body joints are in constant stress from skating and taking hits, stronger joints will help prevent injuries and instabilities. In hockey you're constantly hunched over skating, stronger (lower back/hip) joints will help improve your athletic posture and strength. Mobility: the best way to mobility/flexibility is to keep your mobility and flexibility. 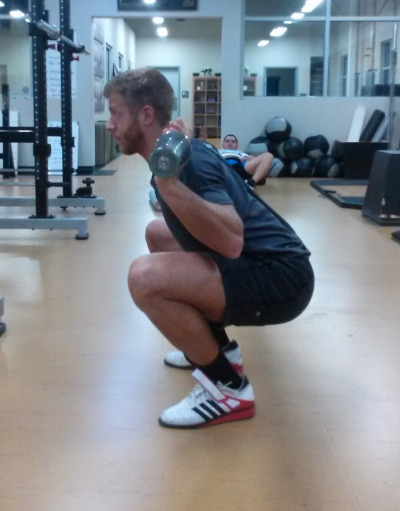 When you perform squats to full-depth you're putting yourself into positions that may not be achieved without weight. This will result in adaptation and will help increase your mobility to create the correct postures through the squat. Hockey players usually have tight hips from skating, squatting can help increase hip mobility by going to full-depth. Increased vertical jump/sprint speed aka explosiveness: we know vertical jumps and sprints all require aspects of power. Full-depth squats will help you do both of these better by facilitating more muscle fibers being worked, like stated above. This will have a crossover with your skating, the increased ability to produce power, the faster the ability you can skate/move. Those 4 points are all an athlete can dream of: increased muscle/strength, reduced injury, stronger joints, more power, improved mobility. Squatting is a tool that shouldn't be overlooked, the earlier you start the better off you'll be for the future. If you're new to squatting and don't have access to proper coaching-check out the two videos below, the first is a video from Mark Rippetoe on back squatting and the second is from Charles Poliquin with tips on front squatting.